Demand for simplified IT infrastructure, to be used in corporate data centers, gained momentum during the last couple of years as more CIOs attempted to offer their internal users compute and storage that could be provisioned quickly -- similar to the major public cloud service providers. 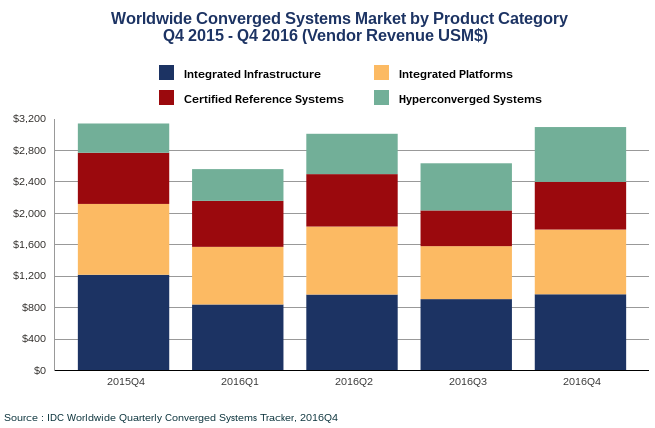 The worldwide converged systems market revenues decreased 1.4 percent year over year to $3.09 billion during the fourth quarter of 2016 (4Q16). The market consumed 1.6 exabytes of new storage capacity during the quarter, which was up by4 percent compared to the same period a year ago, according to the latest market study by International Data Corporation (IDC). For the full year 2016, worldwide converged systems market revenues increased 5.8 percent to $11.3 billion when compared to 2015. "The converged systems market is going through a period of change," said Eric Sheppard, research director at IDC. "We are seeing strong growth from products with new architectures, increased levels of automation, and heavy use of software-defined technologies." That being said, this growth has been offset by reduced spending on traditional converged systems and a conscious decision by some vendors to terminate some parts of their product portfolio. IDC identified four market segments: integrated infrastructure, certified reference systems, integrated platforms, and hyperconverged systems. During the fourth quarter of 2016, the combined integrated infrastructure and certified reference systems market generated revenues of $1.57 billion, which represented a year-over-year decrease of 15.7 percent and 50.8 percent of the total market. Dell Technologies was the largest supplier of this combined market segment with $705.1 million in sales, or 44.9 percent share of the market segment. Integrated Platform sales declined 8.6 percent year over year during the fourth quarter of 2016, generating $823.5 million worth of sales. This amounted to 26.6 percent of the total market revenue. Oracle was the top-ranked supplier of Integrated Platforms during the quarter, generating revenues of $406.9 million and capturing a 49.4 percent share of the market segment. Hyperconverged sales grew 87.3 percent year over year during the fourth quarter of 2016, generating $697.4 million worth of sales. This amounted to 22.6 percent of the total market value. The hyperconverged system market surpassed $2.2 billion in global revenue during the full calendar year (2016), which was 110 percent higher than 2015.